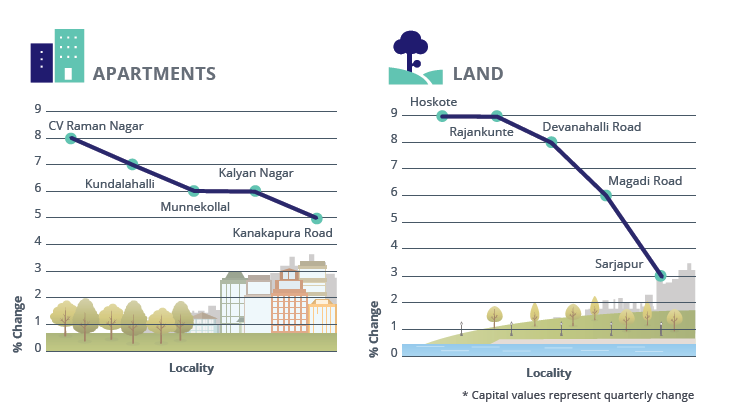 While new launches dipped on account of anticipated stock clearance, capital rates in Bangalore plateaued QoQ. East, South and Central Bangalore did not post any growth in average capital rates of apartments despite the presence of IT/ITeS firms. While piling inventory could be a factor, civic issues such as power outages and water shortage also dampened market sentiments. The proposed Bangalore–Mysore Infrastructure Corridor or NICE Road, which holds the promise of improved connectivity with Electronic City, Bannerghatta and Mysore Roads, drove apartment values in Kanakapura Road, which recorded a quarterly growth of five per cent. Although mid segment properties (Rs 50-70 lakh) in Whitefield witnessed high traction from end users, lack of road infrastructure resulted in apartment values climbing only by three per cent in Jan-Mar 2016. 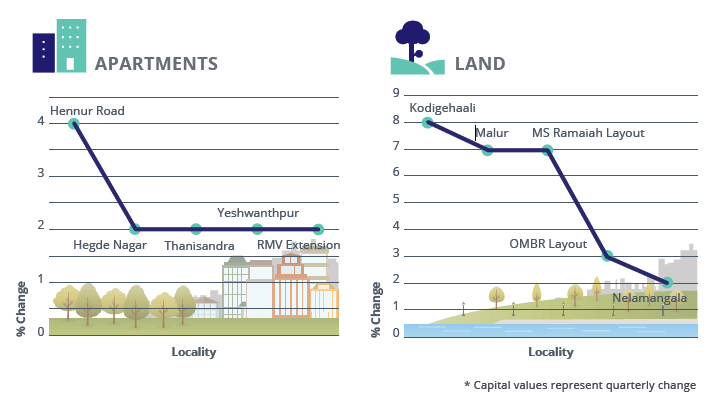 A quarterly analysis revealed that land values in East, South and Central Bangalore averaged a decent growth of two per cent. Prices of residential land in South Bangalore surged by six per cent in the last two quarters. In East Bangalore, Hoskote clocked a whopping nine per cent growth in a quarter. Comparative affordability was a major catalyst of growth for this peripheral locality. Due to abundant supply, the rental market of Bangalore posted a decline of a per cent in the last one year. Despite this, East Banglore in particular continued getting traction from the tenant community. 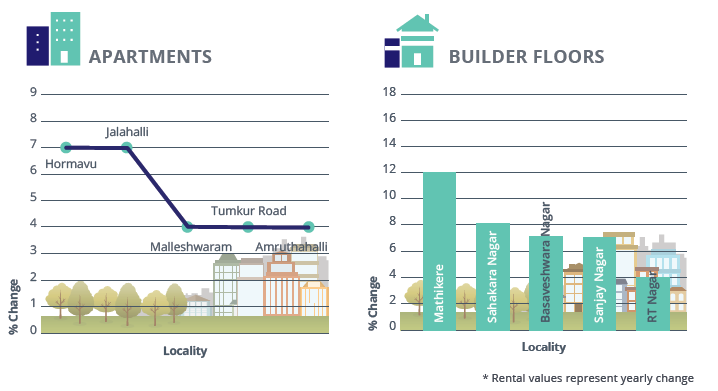 While apartment values in South and East Bangalore fell by one per cent and two per cent, respectively, the market is on a revival mode with localities in and around Sarjapur Road, Electronic City and Bannerghatta Road taking the lead in rental space. Leveraging on quick accessibility, South Bangalore’s Kudlu Gate witnessed a nine per cent appreciation in rental values of society apartments. Rental market in Bommanahalli registered a yearly growth of seven per cent, on the back of a rising migrant population. Electronic City and Bannerghatta Road witnessed rental rates either stagnating or declining due to being optimally priced. Despite improvement in office space demand in Electronic City, there is little possibility of a price hike as values are at their peak levels. Rental values of builder floors in East, South and Central Bangalore grew by two per cent in the last one year. Popularity of these housing units can be credited to their low maintenance costs, thus pocket-friendliness against apartments. 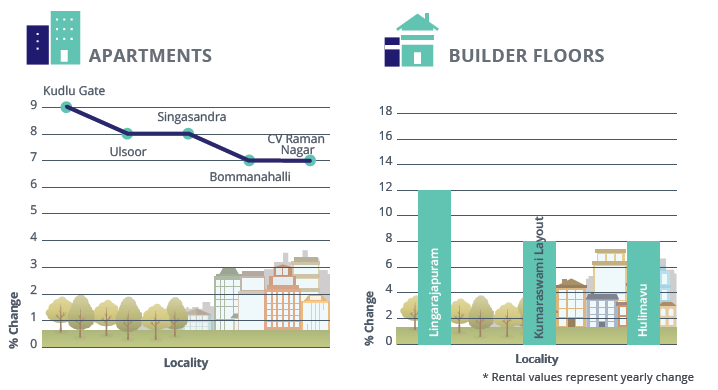 Rents of builder floors in Lingarajapuram escalated to the tune of 12 per cent in Jan-Mar 2016, due to the redevelopment of old residential projects. The area leverages traction from its proximity to the prime addresses, Fraser Town and MG Road. Capital values of apartments emulated land data, both declining marginally in Jan-Mar 2016 as against the previous quarter. In the North, apartments and plots declined by 1-2 per cent, each. The western region witnessed apartment values dropping by three per cent and plot prices by one per cent. North Bangalore’s realty market was more buoyant than the West. Apartments in Hennur Road, Hegde Nagar and Thanisandra were the frontrunners in the city. Similarly, a land data analysis delineated that 60 per cent of the best performing localities were situated in North Bangalore, with Malur clocking an average growth of seven per cent in Jan- Mar 2016 as against Oct-Dec 2015. Housing the international airport, properties in North Bangalore witness high footfall from long term-investors in the luxury budget bracket (Rs 1 crore and above). Value of apartments in Hennur Road spiked by four per cent owing to its proximity to the airport and the city centre. The area will get an edge if the proposal to widen the road into a four-lane highway sees the light of day. Thanisandra’s growth can be attributed to its numerous employment opportunities, comparative affordability and the upcoming metro node at Nagawara, which is at a mere distance of 4 km. Boasting of a comparatively positive story than the South-East localities, rental rates of builder floors in the West swelled by two per cent, while that in the North moved up marginally in Jan-Mar 2016. 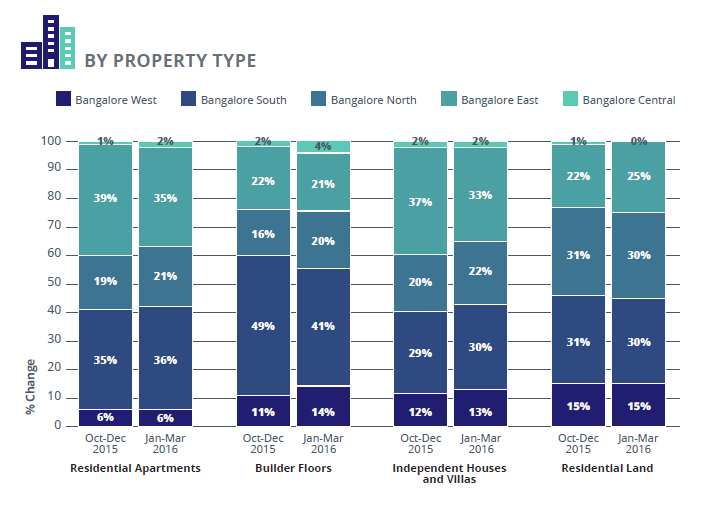 The rental graph of apartments declined, YoY, with North Bangalore reporting stagnancy and the West seeing a drop of two per cent. Builder floors in Mathikere clocked a stunning rise of 12 per cent, making the locality the highest rental grosser. This area owes its popularity to the students of M S Ramaiah Institute, which is in the vicinity. Workforce from the international airport gravitates towards Sahakara Nagar due to its ease of connectivity and cost-effective rental options, thus leading to a spike of eight per cent. While Jalahalli attributes its steep rental climb of seven per cent to its proximity to Peenya industrial area, Hormavu magnetises the workforce of Manyata Tech Park, located 5 km away, to record the same growth, YoY. Both Malleshwaram and Tumkur Road saw rental rates appreciate by four per cent in Jan-Mar 2016 as compared to 2015. While Malleshwaram’s rental market benefits from being at a distance of 6-7 km from MG Road, Tumkur Road gets traction from students of the nearby Sapthagiri College of Engineering. A surge in absorption of commercial space by IT/ITeS and e-comm erce firms, coupled with the adroitness of developers who drove sales while reducing projects launches, spelled well for Bangalore’s realty landscape. Over a quarter of the city’s unsold inventory has been cleared in the last nine months. 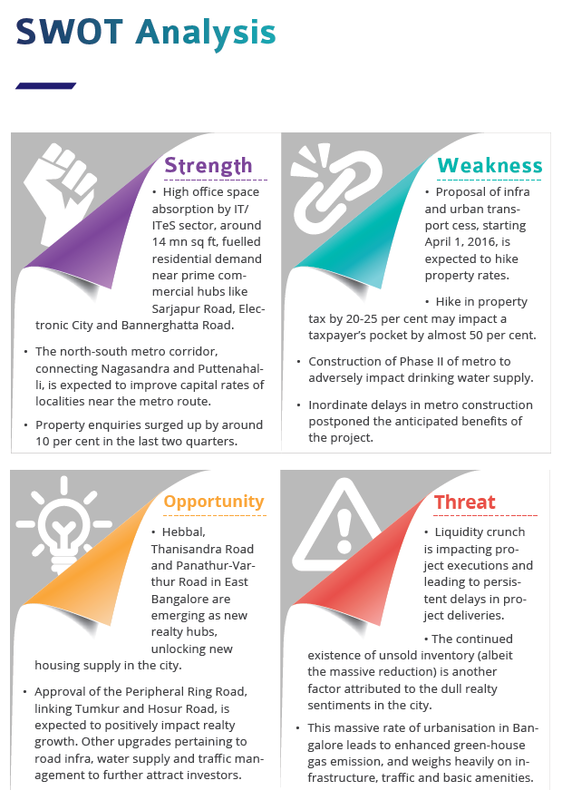 While East and South Bangalore together housed almost three quarters of the total supply of residential apartments in the city, the northern zone witnessed a marginal rise in availability of this property type in Jan-Mar 2016 vis-à-vis Oct-Dec 2015. Popularity of independent houses and villas in East Bangalore has spilled over to the North and South regions, where supply inched up by 1-2 per cent. South Bangalore witnessed a decline in the availability of builder floors in Jan-Mar 2016, while supply of the same increased by an average of three per cent in North and West zones. Affordable properties, within Rs 40 lakh, continued to witness the highest supply of housing units in the city, with South Bangalore taking the lead in capturing a third of the market share. In luxury and ultra-luxury brackets (Rs 1-5 crore), East Bangalore lost its precedence to the South in Jan-Mar 2016, capturing approximately one-third of the total market. Most of the properties in the mid-income (Rs 40-60 lakh) and high-income segments (Rs 60 lakh-Rs 1 crore) were available as builder floors in the southern zone. Popularity of 2BHK units continued to remain unmatched, with this configuration engulfing 50 per cent of the total market share. Demand for 3BHK units has marginally spilled over to 4BHK units. Not surprisingly, most of the 4BHK units are concentrated in East Bangalore. The southern zone recorded a predominance of 1BHK and 3BHK units. Supply of low-income segment homes configured as 1BHK units witnessed a surge in the southern and northern zones of the city. In a sharp contrast to the preceding quarter, ready-to-move properties made up nearly 60 per cent of the market in Jan-Mar 2016, thereby reflecting developers’ intent to complete projects quickly. Among all the zones, most of the ready-to-move-in properties were concentrated in and around South Bangalore. Despite a fall of three per cent in the number of under-construction homes from Oct- Dec 2015 to Jan-Mar 2016, East Bangalore continued to record the highest inventory of the same.